Hate grocery shopping? Too busy to plan dinner or tired of the same old recipes? Have I got a meal deal for you. Meal kits, pre-portioned dinners for two or four that magically arrive at your door ready to assemble in less than an hour, are one of the hottest trends in food. “We’re time-pressed, trips to grocery stores are on the decline and more consumers are looking for a convenient meal solution,” says NPD market research executive Robert Carter. 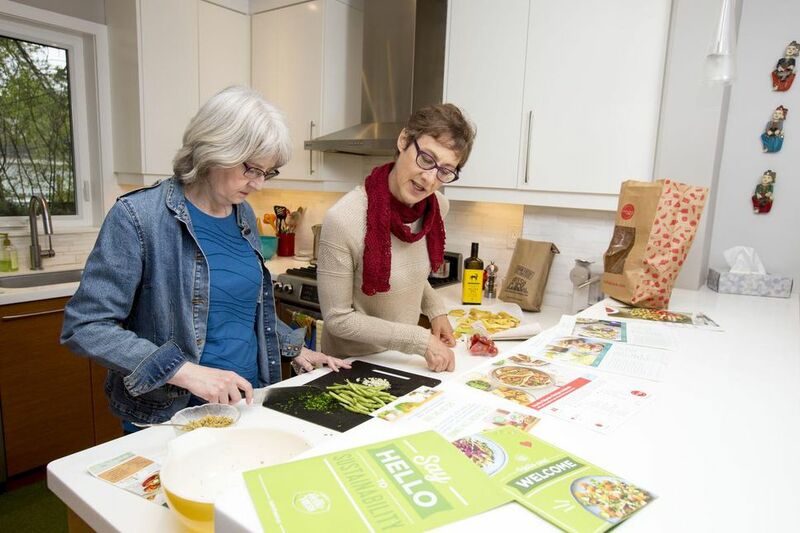 Since barely 4 per cent of Canadians have tried a meal kit so far — he estimates 800,000 chilled boxes are shipped monthly across the country — Carter expects the demand to increase “pretty dramatically” in the next few years for tech-savvy providers such as Goodfood, Hello Fresh and Chefs Plate. Supermarkets are also getting into the act from Longo’s to Metro, which bought Montreal company Miss Fresh. 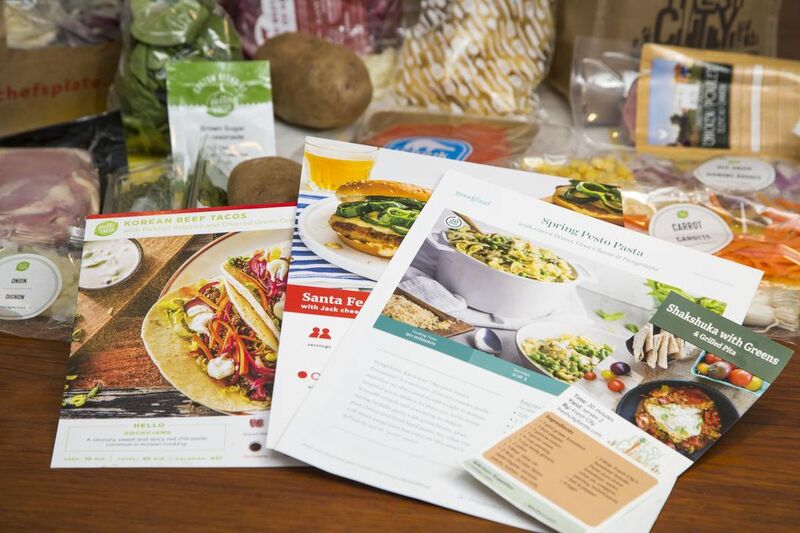 To experience the trend first-hand, I asked the three leading meal kit companies plus local produce and kit supplier Fresh City Farms to send me three two-person meals, which arrive weekly in a box or bag. There are so many good deals at the moment you can almost get your first week for free! Launched in 2014 in Toronto and now national, Chefs Plate is proud of its new 15-minute meals using pre-chopped ingredients. Co-founder Jamie Shea says each recipe is tested five times. 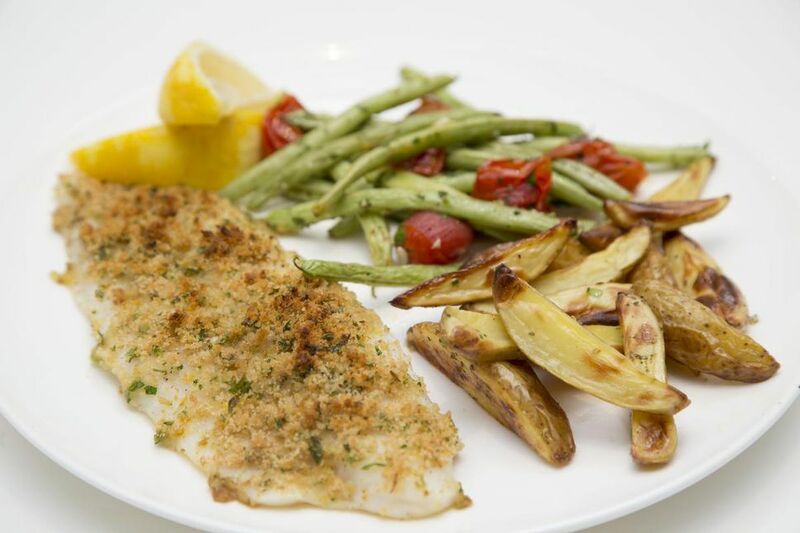 Experience: Baked Lemon-Crusted basa fillets with roasted fingerling potatoes, green beans and cherry tomatoes tastes as good as it looks in the professional photo. The recipe was simple, well-written and ready within the specified 35 minutes. I also tried the 15-minute Smoky Chipotle Chickpea Adobada wraps, with pre-sliced green peppers, chopped onions and sliced, pre-cooked potatoes. Though quick and filling, I found the sauce and spice mixture overpowering. Launched in 2014 in Montreal, Goodfood now delivers meal orders across Canada from Sunday to Friday. “We’re trying to be the Netflix of food,” says co-founder Jonathan Ferrari, who taste-tests 18 new recipes a week. Toronto boxes are packed in Montreal and head down the highway for same-day delivery. Experience: My guy, Andrew, had never seen a chayote before, or peeled a mango or chopped a shallot, but he followed the illustrated step-by-step instructions to create a tropical slaw. Nearly an hour later, after slicing and dicing, marinating and barbecuing chicken breasts and cooking rice then toasting half we sat down, exhausted, to uber-minty Mojito Chicken. The other two recipes were less ambitious, fortunately, but with the same chef’s flair. A little tub of astonishingly delicious pesto coated the Spring Pesto Pasta, and I loved the barbecue sauce, deceptively simple fried onion rings and quality buns for the Barbecue Pork Burgers. Nitpicking: Metric ingredient lists make it impossible to reproduce recipes without a scale. Founded in 2011 in Berlin, Hello Fresh arrived here in 2016. By working directly with suppliers, Canadian CEO Ian Brooks says he can deliver fresh produce, antibiotic-free meat and local or sustainable fish nearly a week fresher than supermarket fare. And the company recycles the ice packs, yay! Experience: Stunning photos, helpful icons and clear directions make cooking easy, from roasted veggies and chickpeas with Israeli couscous to the can of beans simmered into sweet and smoky tenderness over mashed potatoes, topped with the best honey garlic sausages ever. Nitpicking: Loved the pre-diced onion. Didn’t love all the non-recyclable little containers. In fact, excess packaging is a problem with most meal kits, though they’re all working hard to minimize waste. Former Wall Street investment lawyer Ran Goel launched his first farm in Downsview Park in 2011. Fresh City also works with nearly 50 local farms and delivers its own fresh food baskets and meal kits. Goel says Fresh City kits contain “almost 100% organic” ingredients, local when possible. When you’re ready, they’ll pick up the big fabric totes, lunch bags and ice packs. Experience: I loved the freshness of ingredients, from the crisp wedge of cabbage to the firm organic green peppers to stuff with ground chicken and rice. The kit also came with four brown eggs for 30-minute Shakshuka, the Middle Eastern tomato and greens dish I’d been wanting to try. I left the Lox & Schmear on Latkes recipe for the weekend when I had 50 minutes to grate, rinse, pat dry, salt, drain, squeeze dry, press into patties and (carefully) cook potato-zucchini pancakes. Which actually worked! Nitpicking: The photo on the narrow Chicken Paprikash recipe card showed red peppers and I received green. The recipe itself could use a good edit and less paprika! I’ve never cooked so hard in my life! Many of the meals I received were much fancier than I’d ever dream of cooking on a weeknight and involved a number of steps. Yet the sheer variety of ingredients and flavours and the quality of the meat and fish made dinnertime exciting. I also love the fact that you get exactly what you need for the recipe, whether it’s two potatoes or one stalk of celery, so there’s no food waste. You could even use a kit to impress a date or prepare the dish together if they’re into food. Portions were so generous I always had leftovers. Neighbours Brigid and Ted were happy to taste-test, and it was fun sharing the work with Andrew. I even learned a few tricks I’ll use again, like those fried onion rings and the buttery crumb coating on baked fish. Another plus, the meat and fresh produce lasted close to a week in the fridge. Warning: Though you’re not locked into a subscription, be sure to let the company know immediately if you don’t want to continue or don’t need a kit next week or the meals may just keep coming! Hi.wanted to say I really enjoyed this piece in the Star yesterday!!!! Intriguing.. I tried to post a comment on your story but the site wouldn’t accept it even though I included my website. Grrrr. Sorry Susan how kind of you to try! Have you tried Blue Apron or the other US kits? It really was fun though, as I mentioned, a lot of work! I guess they want you to feel you ‘re getting your money’s worth! Anne! You may be surprised, the big guys are pretty proud of their distribution and some use Canada Post. Get a good deal on your first kit (they really want more people to try them!!) and it’s even more fun. Such a fantastic review and read! I’m hooked on GoodFood at the moment. Agree that the metric measurement is SO irritating when replicating the meals. Also, the spice mixes and glazes are often hard to reproduce.